PHOENIX – The Quarter Midgets of America has announced the return of Valley of the Sun QMA, also known as the Phoenix club, back into the QMA family. The Valley of the Sun QMA club was founded in 1958 and was sanctioned by QMA for fifty years. “The vote to return was overwhelming and the club is excited to renew their relationship with QMA,” said Valley of the Sun President Shannon Erickson. “Our board of directors and club members are looking forward to working with the nearby Tucson club, and are anticipating an eventful upcoming racing season in region twelve. “We are looking forward to returning to QMA for our 2014-2015 season. 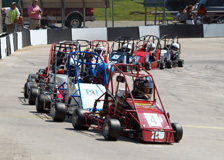 Quarter Midget of America’s mission is focused only on kids, families and quarter midget racing. Also, QMA’s objectives are consistent with those of VSQMA and the majority its members,” said Erickson. “Quarter Midgets of America is excited to welcome Valley of the Sun QMA back to the QMA family,” said QMA President Dave Young. The QMA National Board of Directors is working diligently to assist Valley of the Sun QMA with any needs they may have while making the transition back to QMA.